Merchant Craft Lawrence and wolf goddess Holo continue their journey to her hometown Yoits in the north. Along the way, Lawrence will have to decide between a profit and Holo, whom he now has real feelings for. Spice and Wolf II (狼と香辛料 II, Oukami to Koushinryou tsu, 2009) picks off exactly where Spice and Wolf left off. While the original series was more or less episodic, S&WII was more or less divided into two arcs, the first dealing with making a profit based on the price of fool’s gold, and the latter being about problematic fur trade. Spice and Wolf’s strength was the chemistry between Lawrence and Holo, and I’m happy to say that S&WII continues to develop that. There were instances where Lawrence was separated from Holo, and that allowed for some introspection as far as their relationship went. A good example of this was when Lawrence grew more and more paranoid that Holo had gone off with another merchant and his only chance to win her back is to keep that other merchant from making a profit by crashing the fool’s gold market. He even allowed himself disturbing thoughts as to how far Holo’s relationship with the other guy went. Above all, I think something has to be said when an anime series has a solid romance despite the two leads not exchanging a kiss until the last episode. I have to say that the pacing of this series was definitely better than that of the first. The first series felt a little frantic in comparison with Lawrence traveling, so he was in a different location almost every couple episodes or so. Once again, Lawrence was given an opportunity to stop and assess what was going on more well than he could before. The introspection did have a slight problem though. Basically, I felt Spice and Wolf II was a little too in love with flashbacks. While many times, showing flashbacks of earlier events (occasionally even some from the first show) is to demonstrate the ramifications that event had in the present, I felt that flashbacks did sometimes feel like they were in place just to eat up a couple minutes of the episode. What I found pretty unforgivable was when a scene happened in the last episode, and then a flashback OF THE SAME EXACT SCENE occurred right after. Really? It just happened, why did I need to see it again? While an improvement over the original series, I have to say I’m still disappointed in S&WII’s treatment of side characters. Once again, I felt like side characters had a tendency to get dropped as soon as the story decides that they are not useful anymore. I was really disappointed that Diana, a chronicler Lawrence met in order to learn the location of Yoits, didn’t stay in the story especially after a really interesting fact of her was revealed at the end of the first arc (I beg your pardon, but I’m really trying hard to not spoil anything). I guess it is to be expected that a traveling merchant is unlikely to encounter someone a second time as soon as he leaves town, but I do hope for a return of some of the characters I have seen before. Furthermore, just like how the last episode of the first series just served to segue into the second one, S&WII’s ending just hinted at a (as of yet, nonexistent) third season. 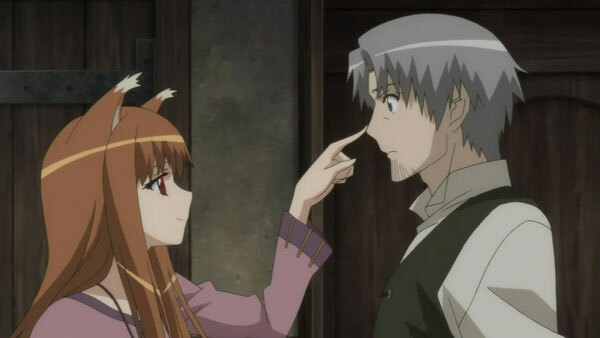 While I did like Spice and Wolf taking its time in developing the lead characters, I have to admit I found it a little frustrating that there is still a while to go before any sort of conclusion to the story of Holo and Lawrence is reached. The original series had pretty high quality animation. I was happy to see that S&WII’s visuals were actually even better than those of the first series. A new character designer was hired for the second series, and there were subtle differences to show it. I really felt that Lawrence aged a little between the two seasons as his face looked slightly wrinkled. At the same time, Holo maintained her youthful demeanor. S&WII also demonstrated that it very much is possible to mesh computer graphics with traditional hand-drawn animation when creating the towns. The towns were very intricately detailed, from the cobblestone on the ground to the festivities the citizens took part in. Spice and Wolf II also sounded as good as it looked. If you read my review of Noir or the album Sora no Uta, you’d know I’m a sucker for Arai Akino. She got to sing the opening theme “Mitsu no Yoake”, which I thought was a great way to set each episode up. Furthermore, I definitely prefer Rocky Chack’s “Perfect World” to “The Wolf Whistling Song” which was the ending in the first series. The rest of the soundtrack was made of the the same instrumentals that were in the original series, which are all appropriate for the medieval era that Spice and Wolf takes place in. The voice acting was definitely good all around. Koshimizu Ami and Fukuyama Jun reprise their roles as Holo and Lawrence respectively. What was interesting was hearing Romi Park as Eve in the latter half of the series. Romi Park is known for having voiced Edward Elric in Fullmetal Alchemist, and I thought hearing Eve with that familiar voice was interesting namely because of how different she and Ed were as characters. Overall, I feel both this and the original could have been combined into one series mainly because of how short they were (season 1 being 13 episodes long and 2 being 12). Basically, if you loved Spice and Wolf, then you should without question watch Spice and Wolf II. However, despite there being some improvements in the storytelling (the chief problem with the first season), if you really disliked Spice and Wolf, then you really want to stay away from this one. I guess all that’s left for me now is to wait for a Spice and Wolf III to come out, even though it has been already two years since II came out. More than anything else, I really want to see a proper ending to the adventures of Holo and Lawrence.